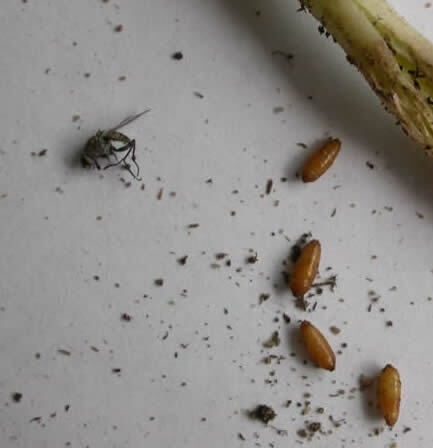 Seedcorn maggot flies are nearly identical to cabbage and onion maggot flies - delicate, hump-backed, brown flies, 5-7mm long - but are distinguishable by the fact that each fly will only appear near its host crop. The larvae, or maggots, are about ¼ inch long, yellowish-white and legless, with a pointed head. Eggs are laid on the soil surface near sprouting or decaying seeds, organic plant residue, or organic soil amendments such as manure or seed meals. Eggs hatch in 2-9 days depending on temperature, and maggots burrow down to find food. 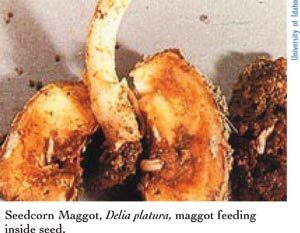 Seed corn maggot attacks seeds - especially large seeds like corn, beans and peas – as well as seedlings of a wide variety of plants. Decay from soil pathogens or previous insect feeding makes seeds or seedlings more attractive to seedcorn maggot. Moist, freshly turned soil is preferred over dry or saturated soil. Damage may be to the seed itself or to roots, stems or cotyledons. Unfortunately, practices that enhance organic matter in the soil may actually worsen seedcorn maggot problems. For example, one field where seedcorn maggot caused significant damage to early peas had been rotated through two years of rye cover crop to build organic matter. Another instance occurred after a thick winter cover of vetch and rye. Conditions that cause slow seed emergence (cold, wet soils) favor seedcorn damage, while those that favor faster crop growth (warmer soils, moderate moisture) help the crop get established before damage occurs. Where possible, delay planting for several weeks after a cover crop is incorporated to help reduce seedcorn maggot problems. Often growers use floating row cover over early crops in order to exclude insect pests, only to find that these seedling pests cause trouble right underneath the cover. This pest overwinters in soil, especially where there is a lush cover crop, and will seek out food and egg-laying sites as soon as they become active in spring. That includes your prized transplants!